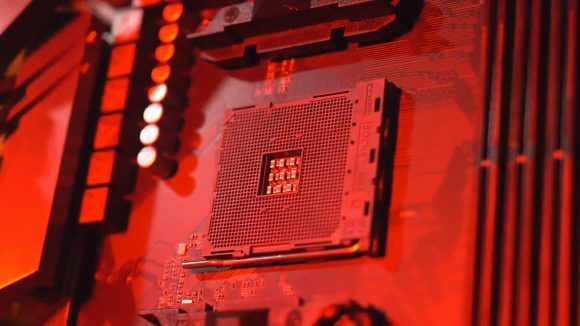 Leaked slides from a Chinese language forum indicate AMD will be releasing the X570 chipset at Computex 2019 – kicking off in the last few days of May. This new chipset will still be rocking the AM4 socket, retaining backwards compatibility with previous Ryzen chips, although the latest rumours suggest AMD’s chipset could also be the first consumer PCH to support PCI 4.0. The slides, allegedly from an internal Gigabyte event, indicate AMD will be overhauling its next major chipset release with PCIe 4.0 support. While current PCIe 3.0 lanes still serves us gamers well, the next generation is set to bring 16GT/s data rates – double that of today’s standard. It also will offer lower latency and keep power draw to a minimum. Matisse, the current codename floating around the interwebs for AMD’s Zen 2 chips, is mentioned within the slides as being an “all PCIe Gen4 solution”, making it the first consumer rollout of the PCIe 4.0 standard. This PCIe generation isn’t expected to stick around for long, with PCIe 5.0 supposedly hot on its tail – similarly doubling bandwidth. But, of course, shaky mobile phones pictures of slides from events are none too trustworthy at the best of times. These slides have their fair share of oddities, too. For one, half of them are in English at an event supposedly held by a Taiwanese company, and subsequently leaked on a Chinese-language forum, gamer.com.tw (via TechSpot). The slides also include first mention of an Intel ‘Glacier Falls’ HEDT (high-end desktop) platform, supposedly incoming in Q3, 2019. Also, Intel is reportedly planning new mainstream Core CPUs with the ‘KF’ suffix, perhaps tied to a lack of integrated GPU. AMD is on track to be an early adopter for PCIe 4.0, with its 7nm Vega 20 Instinct GPU launching with PCIe 4.0 support. The first of its kind on the professional side of things. It’s not just AMD Zen 2 and Radeon Instinct either, AMD Navi could also be the first gaming GPUs to feature the updated PCIe specification. These GPUs are expected to launch sometime late 1H 2019, which would seemingly align with the launch of the X570 platform. While PCIe 4.0 won’t bump performance all that much for gamers directly, it will allow for much more flexibility on the platform side of things. More bandwidth equals more NVMe SSDs, with more lanes available, and sufficient leftover to be used elsewhere. We expect to hear more from AMD in January, when CEO Lisa Su will be taking the stage at CES 2019.